Love Chapter 2 is the second work from Israel’s L-E-V Dance Company, which the Sydney Opera House is presenting under the umbrella title of Love Cycle. Created by the company’s founding choreographer Sharon Eyal in 2018, Love Chapter 2 followed her 2016 work OCD Love with which it is programmed here. 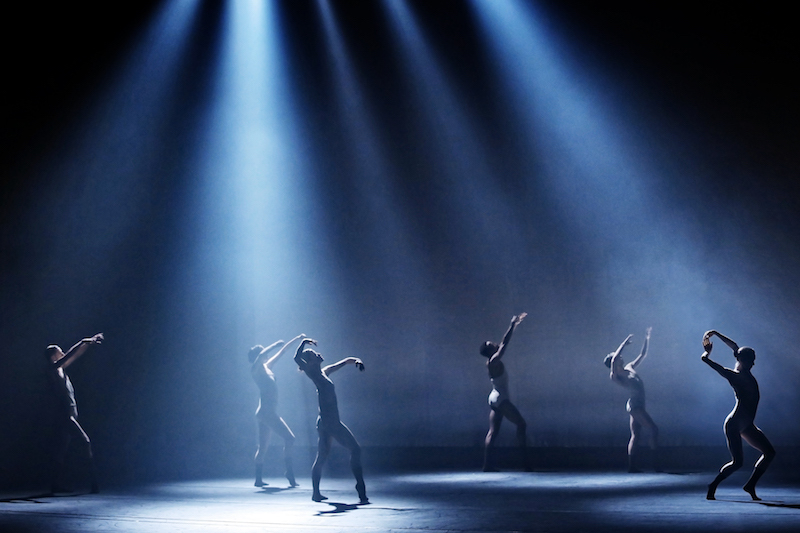 As a drumbeat kicks in, followed by a ticking clock, the curtain rises to show the six dancers, silhouetted against a blue backdrop, bending backwards, arms raised upwards. Unlike OCD Love, where they appear in different formations (solo, duo, and various groupings), here all six dancers (Gon Biran, Rebecca Hytting, Mariko Kakizaki, Keren Lurie Pardes, Darren Devaney, Clyde Emmanuel Archer) are on stage the whole time. Wearing rather unattractive, slightly saggy grey leotards and black socks, they perform for the most part as a group, though occasionally one will be singled out. There is a fair amount of unison work, to which they each bring their own distinctive physical touch. But while they move together, they resemble isolated, lost souls. The score builds into a pulsing techno surge that is loud, repetitive and insistent with a harsh industrial edge, before a Latin folk song breaks in near the end. The dancers stagger, sway and contort, with plenty of back tilting. Their hips gyrate, they drop into wide pliés, they skip on their toes, punch the air with fists clenched, grab at their throats, kiss the air ferociously, and bend forward, rolling into themselves. It’s as if their bodies and souls have been knocked for six, and they are struggling to find a physical and emotional centre. Occasionally you hear one of them shout out (maybe to mark time for each other?). At the end, the six of them walk and run around the space in a circle, and are still moving as the curtain falls, trapped for ever in a horrible emotional void. The dancing is incredibly sensitive to Eyal’s vision, yet the piece itself is so relentless that it starts to wear thin, and you find your attention in danger of drifting. Keeping you as emotionally distanced as it does, Love Chapter 2 doesn’t make you want to cry as Eyal suggests in her program notes. Still, Eyal has a powerful signature voice, producing distinctive, detailed choreography that isn’t afraid to go to very dark places. But for me, of these two productions, OCD Love is the more dynamic and forceful piece.